The problem is that you need to publicize your invention on Kickstarter or Indiegogo or another crowdfunding platform to have money to make and launch your invention, but patent law encourages you to file a patent application before you make your invention public. If you are seeking money to develop and launch your invention, you might not have any money or you might not want to spend any money on a patent attorney before you know whether your product will be commercially successful. On the other hand, a number of Kickstarter campaigns claim the product is patent pending. Here’s how to best protect your ability to obtain a patent on your invention when launching a Kickstarter, or Indiegogo, or other similar crowdfunding campaign. Step 1: Patent Searching. Patents are only granted on new inventions. Just because you don’t see your proposed product on the market, doesn’t mean its new. Many products are described in old patent documents at the patent office, but are not on the market. Hire a patent attorney to do a patent search. If you can’t afford that, do your own patent search to see if your invention is already described in a prior patent or patent application. If doing it yourself, you can word search at the U.S. Patent Office website or you can search by patent class or you can search at Google Patents. Step 2: Draft and File Provisional Patent Application. If the patent search is clear, hire a patent attorney to draft a patent application on your invention before you launch it on Kickstarter. If you can’t afford a patent attorney, draft and file your own provisional patent application after reading a book or two on patent drafting, like Patent It Yourself. Step 3: Launch your Campaign. Hopefully it is successful. Carry out the project plan. Begin selling your product and making money. Step 4: File a Non-Provisional Patent Application. If your product is successful and/or you want to continue seeking a patent, you must file a non-provisional patent application within one year of the filing of the provisional patent application. Use some of the money you made selling the product to hire a patent attorney to do this. DIY on this step is very difficult, harder than any of the of the prior steps. It’s unlikely (not impossible, but unlikely) that you’ll be able to write strong and broad patent claims that will provide you with any value in a resulting patent. Late to the Party: If you already launched your campaign without filing a patent application, you likely can still file a patent application within one year of your first going public, selling, or offering for sale of the invention. But, you should not rely on the one year grace period if you can avoid it. Patent Searching: Is your Invention New? The first step in the patent process is almost always performing a patent novelty search to see if your invention is new. The patent office only grants patents on inventions that are new. But you are planning to launch a Kickstater campaign. Kickstarter is for creative projects. So, you don’t have to worry about whether your invention is new or not, right? Not so. You may have done market research that shows there is nothing like your invention on the market. But there are a lot of uncommercialized products described in patent documents that you won’t find on the market. You can hire a patent attorney to perform a search or you can do it yourself. Patent searching takes time and study to get good at. However, as between doing no search and searching yourself, searching yourself is worth a try. You can word search at the U.S. Patent Office website. However, presently only patents going back to 1976 are word-searchable at the patent office website. Patents older than 1976 are not word searchable at the patent office website. But all patents are searchable by patent class. You can also search through other search tools, such as Google Patents. If the search results look good, you can move to the next step: preparing and filing a patent application. There are two questions at this stage: (1) do I hire a patent attorney or do I do it myself and (2) do I file a provisional or a non-provisional patent application? If you must draft and file a patent application yourself, then you should file the application as a provisional patent application (see this article on provisional vs. nonprovisional patent applications). This is true because the USPTO is less likely to object to your submission (because there are lesser requirements for provisional applications) and because you will want to have a patent attorney draft and file a non-provisional patent application on your invention within one year. If you can hire a patent attorney, then the decision whether to go provisional or nonprovisional may depend on some of these factors: (1) whether you anticipate further developing your product, (2) whether your need a patent sooner/faster (non-provisional) or are ok with delaying one year (provisional), and (3) whether you need your upfront cost to be as low as possible (provisional). Here’s how to decide between a provisional and a nonprovisional patent application. It is recommended to hire a patent attorney. It is hard for someone to write a good patent application on their first try (see the problems that can arise in writing your own patent application). However, you are seeking funding through Kickstarter, so there’s a chance that you don’t have any money to hire a patent attorney. Or maybe you could afford it, but you take a business risk and allocate such money to other portions of the project. If for whatever reason you decide to skip hiring a patent attorney, you should take a shot at drafting and filing your own provisional patent application, because it has a chance of being better than doing nothing. There are two approaches to drafting your own patent application. The first is to take whatever technical description you already have written along with any drawings and file them as a provisional patent application along with the provisional application cover sheet. The patent office will not review the content of your provisional patent application and therefore will accept just about anything as a provisional patent application (e.g. scientific papers, marketing sheets, back of the napkin sketches). This first option to just file whatever you have already written is the easiest and fastest option but the worst in terms of your chances of the provisional application “holding up” and being worth anything later. The better second option is spend some time studying the requirements and form of a proper patent application. You might seek out patent self help books for this purpose, such as Patent It Yourself. These books are not a substitute for hiring a patent attorney, but if you must do it yourself, these resources are a good start so you will have a better chance of writing an application that might be worth something. Again there’s no guarantee that the application you write will hold up, but its possibly better than doing nothing. Now you can launch your campaign. Hopefully it is successful. Carry out the project plan. Begin selling your product and making money. After the provisional patent application is filed and your project is launched, if the project is successful and you want to continue to seek patent protection, you will need to have a non-provisional patent application written and filed before the one year anniversary of the filing date of the provisional application. For this you certainly want to hire a patent attorney. Hopefully sales of your product have generated revenue, some of which you can use to hire one. On the other hand if the project doesn’t take off and you don’t want to continue in the patent process, then you can do nothing and let the provisional patent application expire. I Launched Without Filing a Patent Application, What can I do? If you already launched your Kickstarter campaign without first filing a patent application, you may still be able to file. While patent law after the America Invents Act still has a one year grace period for certain circumstances, you should not rely on the grace period if you can avoid it. However, if you’ve already gone public with your invention, you may still file a patent application within one year of first going public, selling, or offering the invention/product for sale. 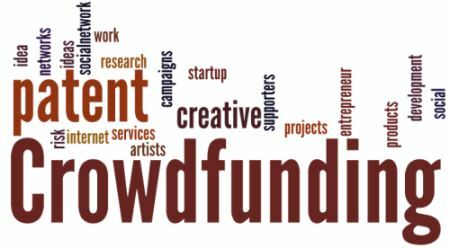 The above guide provides the you with options, depending on the available resources, to patent protecting your invention when launching a crowdfunding campaign for products (and certain types of services). Next PostNext Should I File for a State or Federal Trademark Registration?